With our golden beaches, un-spoilt landscape and diversity of wildlife, the Outer Hebrides are undoubtedly the jewels of the Scottish Isles. With an identity, culture and heritage all of our own, these ‘islands on the edge of the world” are a unique and desirable place to consider for your home. With a close knit and welcoming community, a rural and tranquil setting and transport and communication links required for modern living, the Western Isles have become one of the most sought after areas to reside in the country. Our unique islands contain a diverse landscape, changing from the expansive, ethereal moorlands of the Isle of Lewis through to the spectacular rugged mountain terrain of the Isle of Harris and beyond to the machair, mountains and long sandy beaches of the Uists. Steeped in history the islands have a fascinating archelogical history and contain some of the most prominent archaeological sites in the whole of the UK. The beauty of the islands is evident to all who visit and the ever changing land and seascapes have captured the hearts of many an artistic soul over the years. The stunning beach at Luskintyre is a world renowned beauty spot yet remains simultaneously wild, untouched and idyllic. With stunning mountain, moorland and coastal walks, a plethora of birdlife for birdwatchers and a pristine marine environment the Hebrides is a Mecca for lovers of the natural world. To the north you have the Isle of Lewis, most famous, perhaps, for the 5000 year old Callanish stones, a site of high archaeological importance. The landscape in Lewis is sprawling and expansive with great open moorlands boasting panoramic vistas over the hundreds of lochs and Lochans and coastlines. Traditional crofting and fishing villages are dotted around the Isle with the main town of Stornoway situated here. Stornoway has a population of approx. 10,000 and has all the amenities expected of a modern town. Beautiful beaches can be found on the West Coast of the Isle of Lewis and also at Tolsta on the East Coast. 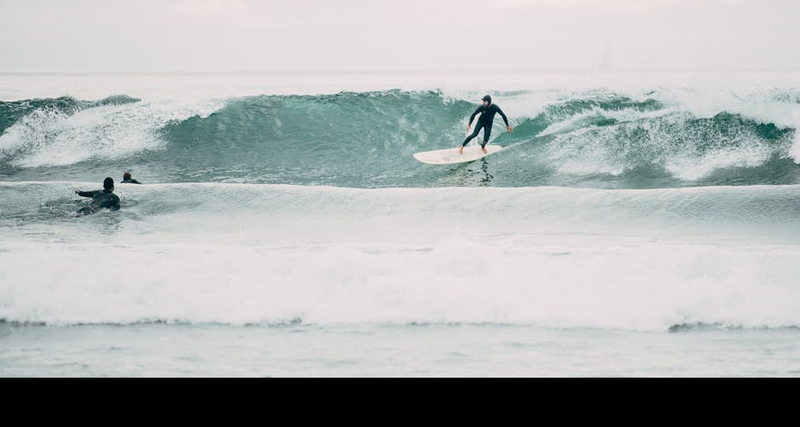 The West coast is particularly popular with surfers as the huge Atlantic breakers roll in from the West. Kayaking, kiteboarding, fishing and windsurfing are all easily enjoyed around this extensive coastline. Travelling down into the Isle of Harris a simply spectacular landscape opens up. North Harris houses the highest peak in the Hebrides, The Clisham, and the mountainous ridges and peaks in the vicinity create a dramatic backdrop to the tiny villages nestled in their shadows. The main town of Tarbert is situated in Harris which, although small, has many amenities such as a Secondary School, sports centre, shops, ferry hub and restaurants. Continuing down through the island the West and East coast of Harris are distinctly different. The East coast road takes you on a winding tour along a rocky and picturesque coastline while the West coast road encompasses some of the most stunning beaches in the Uk, Europe and even the world! The flower filled machair carpets the land and pristine, pearlescent white sand and sparkling clear blue waters stretches for miles along the untamed Hebridean shores. Crossing the sound of Harris you arrive on the Isle of Berneray where rocky little coves and more white sand greets you. Driving across the causeway into North Uist you will be treated to yet another endless chain of beautiful white beaches. 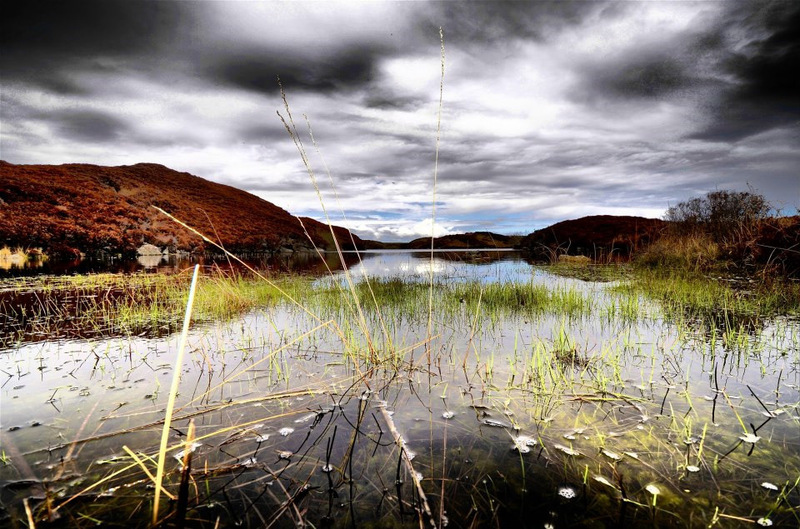 This remote landscape sustains and wealth of bird and animal life alongside the crofting communities of Uist. 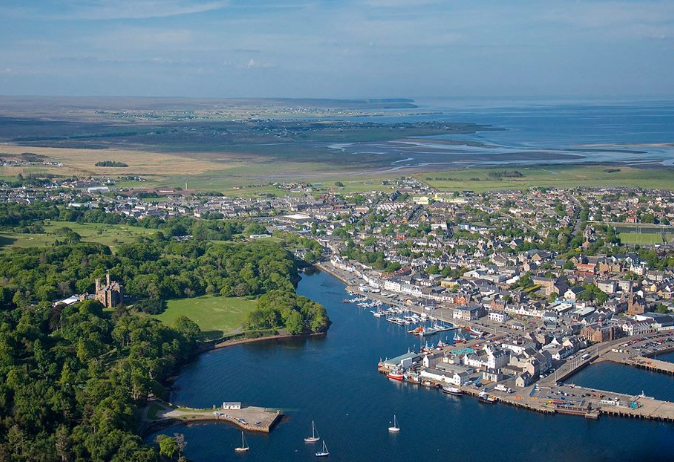 Again, there are many archeological sites of note in the area and the rugged East Coast is dotted with numerous sea lochs and natural harbours. Lochmaddy is the main hub in the area and has shops, hotels, Arts centre and is also the hub for the ferry to the mainland and Harris. Over the causeway and onto Isle of Benbecula you will find by contrast a low lying island where the islands airport is situated. This has regular air links to Stornoway, Glasgow, Inverness and Barra. There is also a sports centre, shops, restaurant, supermarket and the local Secondary school all on this island. It is also home to a great deal of birdlife on the machair, more wide white beaches and also working croftland. South Uist is a long narrow island with a rugged, mountainous terrain to the east giving scope for spectacular hillwalking. Gleaming, pristine beaches stretch almost the whole way down the West coast. 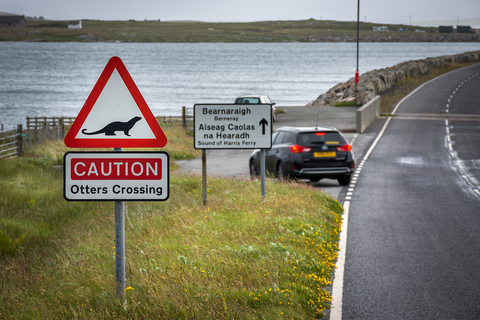 Eriskay, the setting for the film ‘Whisky galore’ which tells the story of the SS Politician which ran aground on the island in 1941 with its cargo of whisky, is reached by a causeway from South Uist. It’s a pocket sized version of your typical Hebridean island, machair, beach and pub included. 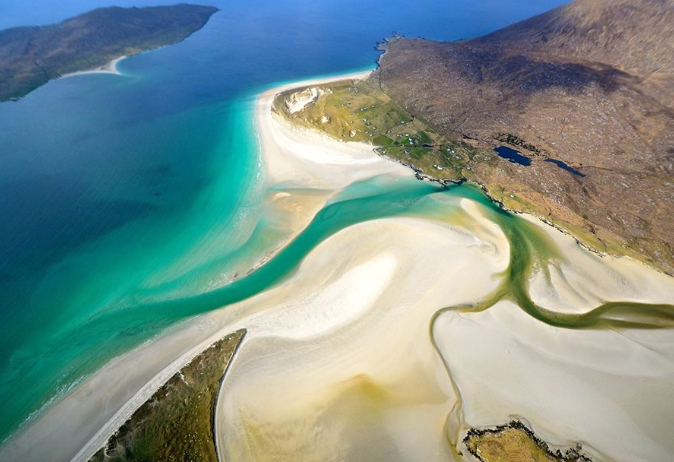 Barra, roughly 60 square km, is a mix of rocky inlets on the East coast and beautiful shell sand beaches to the west. 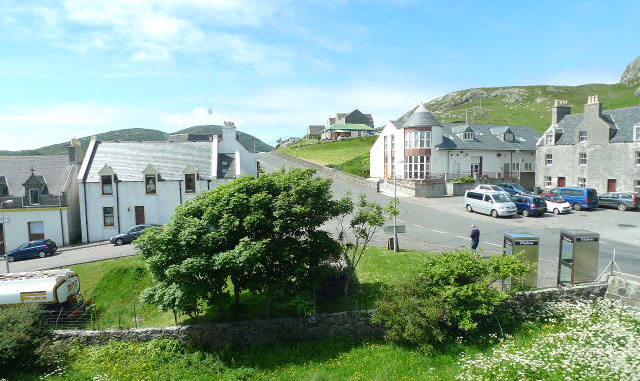 The main village of Castlebay is the hub for the ferry and also has the famous Kismul Castle dominating the harbour. There is also the Barra airport where the beach becomes a runway. Vatersay, reached by a causeway, is the end of the line of this enchanted chain of islands. A peaceful haven with sprawling machair land and beaches to take you for magical walks at the edge of the world.